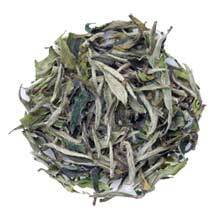 Bai Mu Dan is the second finest White tea after Yin Zhen. Our Bai Mu Dan is made from carefully picked tea buds and leaves from the Da Bai (Big White) strain of tea trees, undergoing just steaming and drying to leave it close to its natural state. Like Yin Zhen, Bai Mu Dan is known to have anti-toxin and cooling properties to help to decrease body heat. This is a special Cha Wang (Tea King) grade of Bai Mu Dan and is exclusively made for TeaSpring. Only the best tea leaves picked in early spring are used. The fragrance is refreshingly sweet while the taste is smooth and refreshingly delicate. The soft taste gradually changes into floral sweetness. Later infusions have hints of chestnut taste. This complexity in taste is rare for white teas. Tea leaves are made from downy 1 bud 2 leaves variety. The buds of Cha Wang grade Bai Mu Dan is larger than the leaves.